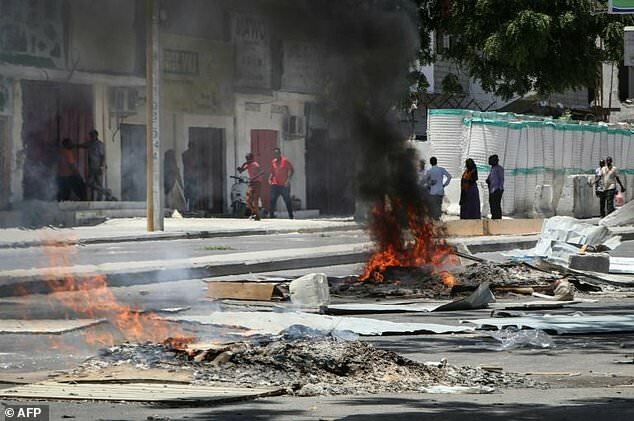 Fires are seen on a street following protest against the shooting by security forces of a rickshaw driver and his passenger, on April 13, 2019 in Mogadishu. At least three protesters died in Mogadishu when hundreds of auto-rickshaw taxi drivers took to the streets Saturday after an officer shot and killed a driver. The protest erupted shortly after police forces allegedly opened fire, killing one driver and a passenger at a checkpoint near the main Bakara market on the south side of the city. Mogadishu mayor Abdirahman Omar Osman called for calm after the latest in a series of similar incidents. According to witnesses, at least three people had been shot dead at Saturday’s protest — but it was not clear if police had fired on them or else security guards from a local firm caught up in the unrest. Muhidin Adan, a rickshaw driver who took part in the rally, said one officer fired two shots and killed the driver and a passenger after his three-wheeler did not heed a call to stop while looking to park. Some bystanders said the police officer involved in the shooting fled the scene. Within minutes angry protesters took to the streets, burning tyres and throwing stones as they demanded justice for the victims.